Olivia Johnson/Mather/Holloway is a thief and an imposter. If she secures a job as parlor maid in the household of Alastair, the Duke of Marwick, she plans to steal from him. She feels guilty about what she considers immoral acts, but her need is desperate. She has learned that Marwick has in his possession dossiers on his political allies and opponents, files that include evidence of crimes committed by some of these powerful politicians. Olivia is interested in one particular file because having it may save her life. Even though Olivia knows that Marwick has isolated himself in his home since he discovered that his wife betrayed him before her death, she is unprepared for the chaos she finds in his home or for his beleaguered butler’s request that Olivia fill the position of housekeeper. It’s a tempting offer since as housekeeper she will have far more freedom to conduct her search than she would have as a parlor maid. Five days on the job, she learns that not only has the duke not left his house in ten months, he has refused to leave his room. Perhaps he is the madman his servants believe him to be. Alastair de Grey, fifth Duke of Marwick, is the essence of a tragic hero. Once one of England’s leading political lights, in line to become Prime Minister with the power he covets to see more of his reform agenda realized, he has become a man immersed in his own particular horrors, afraid to leave his room for fear he will murder those men with whom his wife betrayed him. His fear of translating his murderous thoughts into murderous actions and his fear of becoming fodder for the scandal sheets have led him to abdicate his responsibilities on every level. If madness is the inability to think in a clear and sensible way, then Marwick is indeed mad. Olivia dares the duke’s wrath even after he throws a bottle at her. Angered by his disregard for care of the valuable books in his rooms, offended by the dirt in which he lives, and dismayed by his irresponsibility in ignoring his correspondence, she challenges him at every turn until gradually, one cautious step at a time, Marwick returns to life. But even when the attraction between them intensifies, Olivia cannot forget her purpose. She must have that file, although she knows Marwick, a man already devastated by betrayal, will view her theft as yet another unforgiveable betrayal. 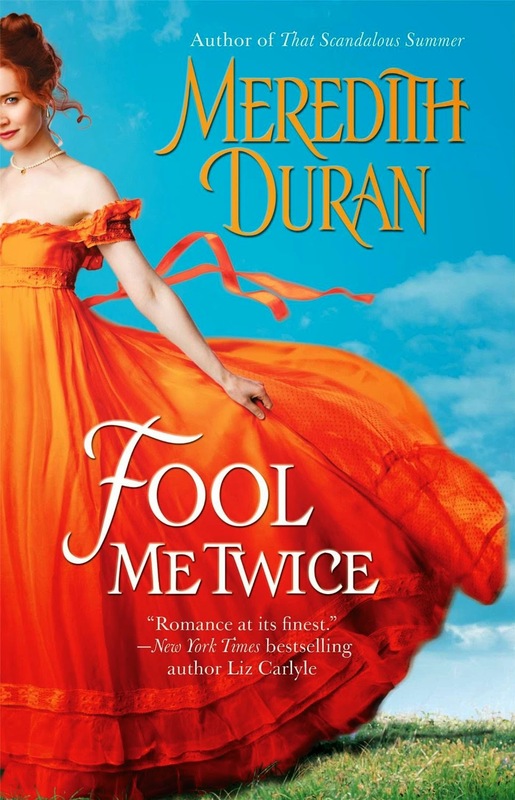 Fool Me Twice is a romance with a strong mystery element, and Duran succeeds in keeping her readers emotionally invested in the relationship between Olivia and Marwick as it develops, is threatened, and overcomes obstacles on its way to the HEA and in maintaining their interest in discovering the identity of Olivia’s enemy. It’s a plus that the revelation is not the predictable outcome many readers will assume. Marwick’s story too has revelations as readers learn more about the details and the motives of his wife’s betrayal. He thought once that he saw every possibility. That he would make his own destiny. That he and Margaret, together, would be everything the world required. He thought he had control, and that everything he did was done perfectly. As always with a Duran book, the writer in me relishes her prose. Not only does it have a lucidity and grace that pleases but the precision of the diction in sentences like this one adds to the layers of meaning: “His insanity had a feel to it, jagged and sharp, so the very air in his bedroom seemed filled with edges.” Those edges pierce Olivia’s—and the reader’s--preconceptions. Fool Me Twice is the second book in the Rules for the Reckless series. While it can be read as a standalone, I think the story has greater depth for readers who have also read That Scandalous Summer. Not only are both Olivia and Marwick introduced in that book, but Olivia’s connection to Elizabeth Chudderley and Marwick’s estrangement from his brother Michael are also shown in the first book. Whether you read Fool Me Twice alone or in concert with That Scandalous Summer, if you like romance novels that are intelligent, intense, and immensely interesting, I highly recommend this one. Oh, this sounds good! Time for a visit to Amazon! I will have to check into the Rules For The Reckless series. Great review. I really liked That Scandalous Summer, so I'm looking forward to reading this one. Thank you for the recommendation. I will read both books in order. Great review! Thanks for another informative review. This is definitely a book I would love to read. Distinctly different characters and in keeping with the time period. It has the type of both character and plot development I like. I really need to stop reading your reviews. Now I have another must read author to add to my list. I do look forward to checking out her books.